in a jar combine 2 tbsp each of grated organic ginger, raw sugar, and pure water. Cover with a cloth, a loose lid, or close the lid, it doesn’t matter which. Every day, add 2 tbsp more of ginger, sugar, and water if it looks dry. Stir often during the day to encourage yeast colonisation and growth. Keep in a warm place, and within a few days, the mix should be bubbling with active yeasts. A pale sediment layer often forms on the bottom of the jar – this is normal, a combination of spent and active yeast cells. Dice or grate the ginger root, and place it in 2 litres of water. Bring to a boil, then simmer gently for 20 minutes. Strain out the ginger, and pour the liquid into your fermenting vessel. Add the sugar and stir until dissolved, then top up with the additional water. If using raw honey, add the additional water first, and add the honey when the temperature is below 30° C. When the brew is at room temperature, stir in the ginger bug (and lemon if using) and stir vigorously. Stir often until the brew is bubbling away when you are not stirring it. When this occurs, bottle straight away for non-alcoholic ginger beer, or leave to ferment for longer for an alcoholic drink. Bottles should only be left out the fridge for a few days, as excessive carbonation can lead to explosions. If making a lot, bottle one in plastic so the bottle can be squeezed. When the sides no longer give with ease, transfer to cold storage. Drink quickly; fermentation is only slowed by refrigeration, not stopped. Try also half and half ginger/turmeric for a good, sharp tasting tonic, even add horseradish if you are adventurous. 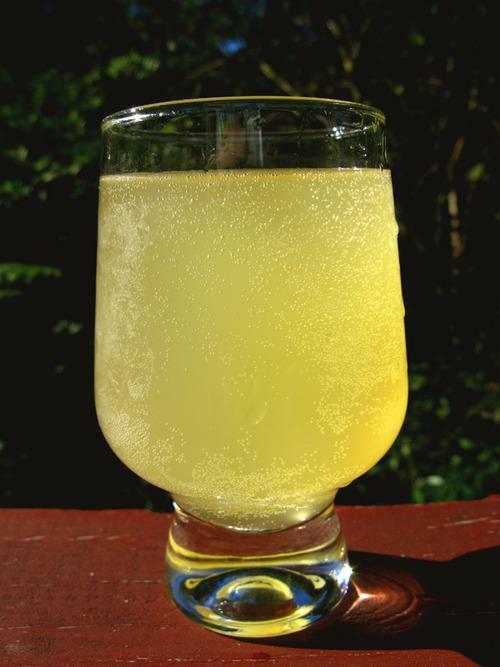 The ginger beer shown above also has turmeric root and juniper berries. The one I have brewing now has ginger, turmeric, lemon myrtle and Australian native sarsaparilla. Be bold with flavours, the ginger holds it all together!